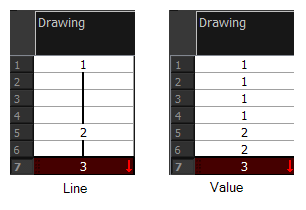 In Harmony, you can customize the way the column displays drawings, empty cells and the column width. 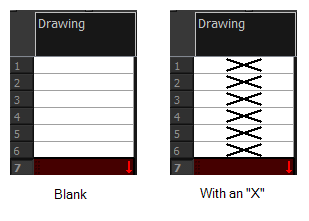 From the Xsheet menu, select View > Empty Cells > With an “X” or Blank. From the Xsheet menu, select View > Row Units > Frames or Feet. In the Xsheet menu, select View > Held Exposures > Line or Value. In the Xsheet view, select a column. From the Xsheet menu, select View > Set Columns Width. The Xsheet Column Width dialog box opens. In the Column Width field, enter the desired width in pixels. Click OK to validate and close the dialog box. Click Apply to validate the operation and keep the dialog box opened to adjust the next column’s width. Click Set As Default to create all the new columns to this width. To restore all columns to the default value, in the Xsheet menu, select View > All Columns to Default Width.